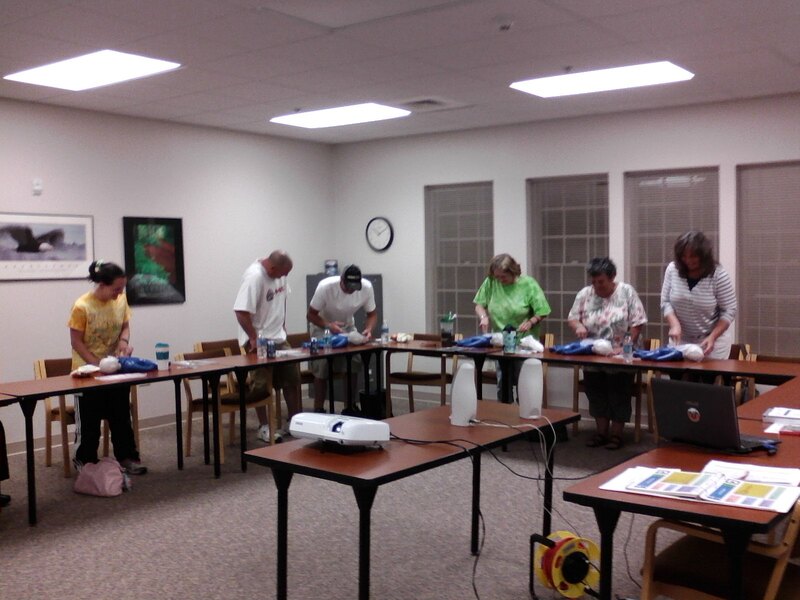 August 20th, 2013 (West Liberty, OH) – Six local residents and employees of local businesses successfully completed a community CPR training course offered by the Macochee Joint Ambulance District at the Green Hills Community in West Liberty on Tuesday. By learning potentially life-saving skills, these individuals are contributing to the safety of their community, and represent the first link in the chain of care for those suffering a cardiac emergency. Five of the students completing the class were sponsored by their West Liberty area employers. Yoder Concrete, LLC sent two employees, and It’s a Rainbow World Child Development Center sent three. The sixth student was taking the class on her own initiative. The students completed the American Heart Association “Heartsaver” CPR/AED (cardiopulmonary resuscitation / automated external defibrillator) course, where they learned appropriate actions to take during cardiac emergencies. Students learned life-saving skills including the assessment of cardiac emergencies, chest compressions, rescue breathing, and use of the AED. 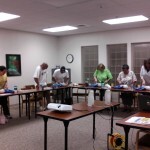 The students demonstrated mastery of all requisite skills for adults, children and infants during a hands-on exam. All of the students qualified for an American Heart Association certification card. Residents of the levy-paying areas of the Macochee Joint Ambulance District may take these classes at no cost. Non-residents are welcome to register, but must pay $25 to cover materials. The levy-paying areas include all of the Village of West Liberty, all of the Logan County townships of Liberty and Monroe, and those portions of Union Township that are a part of the District (the same as those portions that are within the West Liberty-Salem and Bellefontaine school districts).